Photos by Jiun Yap from the RIAT 2015 air show on Sunday July 19th. On July 17-19 the 2015 Royal International Air Tattoo took place at RAF Fairford. The biggest military air show in the world now includes air show on the Friday following last year's success when the Friday was dedicated to the Red Arrows 50th display season. Friday had a reduced flying display, as not all participants had arrived on July 15-16 yet. RIAT 2015 saw the international debut of the Kawasaki P-1 Maritime Patrol Aircraft developed for Japan's Maritime Self-Defense Force (JMSDF). The Japanese had sent two P-1 aircraft, 5504 took part in the flying display while 5507 was in the static park. The full air show on Sunday was eventually treated to blue skies perfect for the grey jets and dark green helicopters, while a perfect sky of course never hurts the colourful display teams. 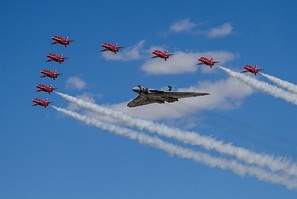 The Patrulla Águila opened the show, the Red Arrows displayed mid-show after a formation fly-by with the Vulcan XH558, while the Patrouille de France were the finale.